Your sump pump is vital to keeping you from finding yourself ankle-deep in water and the high bills from flooding damage. However, these pumps have a short life expectancy and may not always be up to the task of keeping your basement dry. With that in mind, the experts at RestoPros are here to help you prepare for such a disaster and advise you on what to do if your sump pump fails. The first step you should take in the event of sump pump failure is to call a plumber that can repair it. Especially if you don’t have a backup system, this should be a top priority. Use a basement water pump. While waiting for the plumber to make the repairs, you can help reduce the flooding by using a basement water pump. These can be found at any local hardware store and are able to operate continuously during the flooding event. Sucking up the water and transporting it through a hose to a bathtub or drain, a basement water pump automatically shuts off once the water stops. Enlist the help of a Certified Water Mitigation Company. Because you would only be paying them to pump out water as more enters, this should be second to having a plumber repair your sump pump. Once you have repaired your pump, contact a water restoration company that can begin the process of drying and repairing the damaged areas. This is an important step that you should not wait to take after your sump pump is repaired, as you don’t want to give mold and mildew time to grow in your house. 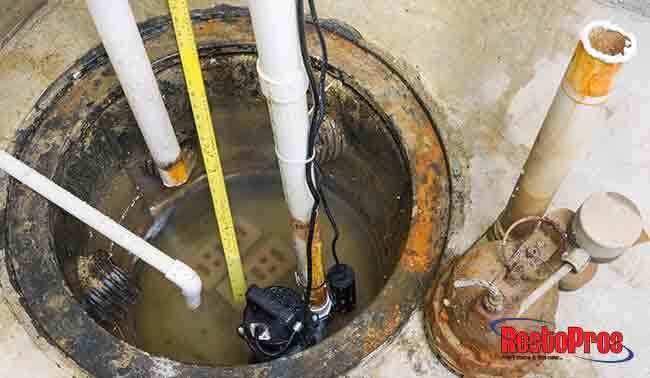 Install a sump pump alarm system. Although not a standard alarm, this system monitors your sump pump’s viability and activates the sump pump if there is a rise in water of more than ¼ inch in the pump basin. With one float acting as an activator, a second float is included to kick in as a backup if the first float fails. Made in the US for domestic applications, this alarm system features a red LED light that flashes when the alarm sounds to alert you to rising water. With an easy installation process, this alarm system can be mounted on the head unit. Offering an affordable price and no monitoring fees to a third party if the alarm goes off, this is a dynamic option. Not only does this system alert you to high water, but it also warns you of extreme temperatures and power failures. Additionally, you can program this unit to call up to 3 contacts in the event of an emergency. Invest in a backup system that includes an audio alarm. Many backup sump pump models include monitoring systems that can warn you with a message and audio alarm. In addition to alerting you to rising water, these systems can warn you of pump failure. Furthermore, some advanced systems warn you of low battery fluid and corroded battery terminals. Although effective in keeping your basement dry during sump pump failure, an electric pump requires power to work. Therefore, a power outage during a major storm or flooding event could render a secondary electric pump useless. This is a good option if your water comes from a municipal source, as this pump requires constant water-flow. That is to say that this backup system pushes the flowing water from a city supply through a venturi. As a result, this forms a low-pressure region. Then, as it flows through the device, gravity and flow pressure push water out of the sump pit. Lastly, the system empties the excess water. Although this is a viable backup system, a drawback is it must use a separate discharge than your primary pump. Like your main pump, this system uses a float switch to activate the pump when water rises in the sump. Furthermore, this system is Installed adjacent to your primary pump. Therefore, it can be plumbed into the central discharge pipe or with an independent discharge pipe. This system is a wise choice for backup in the event of power outages. What is the best piece of advice for what to do if your sump pump fails? Call in the experts at RestoPros. Our team of certified water damage restoration experts are dedicated to finding fast-acting solutions for any of your problems. To tackle your household water damage with the team you can trust, call us today at 855-587-3786 or fill out a service request form on our website!